History of Brora Golf Club, Highlands, established in 1891. 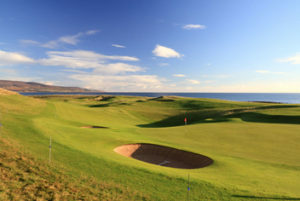 Brora Golf Club was established in 1891 and recently celebrated its 125th anniversary. Originally 9 holes until around 1900 when the club was extended to 18 holes. In 1923 James Braid, five times Open Champion and a prolific designer of golf courses, was invited to visit by the club committee. This he did in 1924 and for the princely sum of £25 plus travelling expenses, submitted plans for a redesigned 18 hole layout. This was largely implemented as he suggested and remains mostly unchanged to this day. It remains a fair and challenging test of true links golf. Written by Hugh Baillie in conjunction with Brian Anderson and designed and typeset by member Lesley Beaney – Congratulations to all concerned on an excellent and interesting book, beautifully presented and a proud addition to anyone’s library. ‘Hootie’, as he is affectionately know, has painstakingly evoked the spirit and background to the club over the many years it has been in existence. 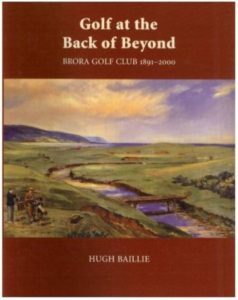 A former club champion Hootie also served as President and Secretary of the club and his knowledge , dry humour and careful observations make this a must read for anyone with an interest in golf in general but Brora Golf Club in particular. Hardback copies are available from Malcolm Murray in the Professional's Shop. They make a great gift for the Brora afficionado. The book sells at £20 plus p&p of £5 (UK) and £9 (Europe and rest of the world). Orders can by placed by email at malcolm.murray@broragolfclub.co.uk, by telephone on +44 (0) 1408 623833 or by contacting Malcolm Murray, PGA Professional.